Bueren Mountain is not a real mountain. 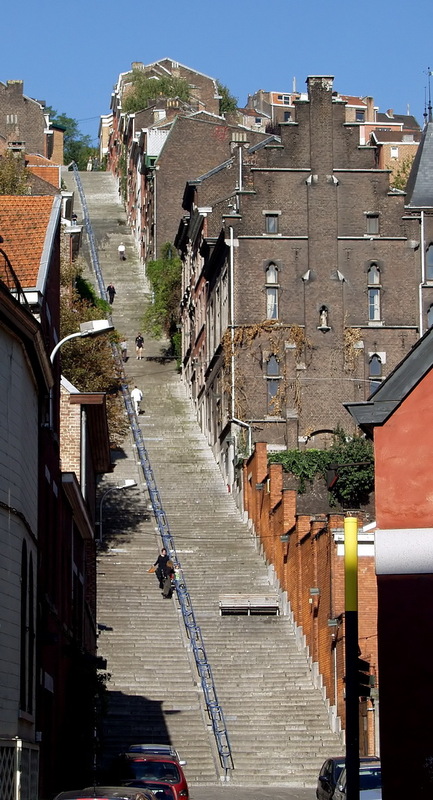 It is a 374 steps long staircase in Liège [Belgium]. The stairs were built in 1881 to allow soldiers on top of the hill to go down to the centre without having to walk through the dangerous alleys. 374 risers x 7.5 inches (assumed existing) makes it about +234 feet in elevation. If that staircase were constructed in the US under current handicap accessibility codes (ADA), not only would the stair run be longer, the required ramp (assuming a straight run with no switchbacks, and including 5-foot long landings every +30 inches) would reach 2/3rds of a mile in length. Aside from Mr. Slinky, it’d be a skateboarder’s vacation dream. Get air 94 times before you eat the pavers or blast some poor soul at the bottom of the run. Take away the landings and brakes, and Mr. Wheelchair & Mr. Skateboard end their 12 second journey at over 120mph. On the other hand, Mr. Slinky, at 1 second per step (do Slinkys speed up?) would make it to the bottom in about 6 minutes, ready for another go. I’d rather be Mr. Slinky. This entry was posted on Wednesday, 28 August 2013 at 12:05 AM and is filed under Bizarre, Cool, History, Humor, Odd, True Stories. You can follow any responses to this entry through the RSS 2.0 feed. You can leave a response, or trackback from your own site.